Growing up on a dairy farm near Plainfield, Iowa, Dr. Phyllis Frost was surrounded by animals from an early age. In addition to the cattle, horses, hogs, chickens, dogs, and cats that she regularly spent time with, she would also bring home plenty of wild animals to save! As she got older, Phyllis realized that a career in animal care was the only path for her. Dr. Frost first attended a Veterinary Technology program at Northeast Missouri State University, graduating in 1980. She worked as a certified Veterinary Technician for eight years, then got the itch to own her own practice. She returned to school at Wartburg College, graduating with a Bachelor’s degree in Biology in 1990. From there, Phyllis was accepted into Iowa State University’s College of Veterinary Medicine, earning her degree with top honors in 1994 and opening Avenue of the Saints Animal Hospital shortly thereafter.Dr. Frost has three children. Dr. Jami Mallen is also a veterinarian and works alongside her mother right here at the clinic. Dr. Frost’s son, Jacob, currently serves in Ramstein, Germany, as a member of the Air Force. Phyllis’s youngest daughter, Jordan, is still in elementary school. Together, they share their home with five Shetland sheepdogs, two indoor Cornish Rex cats, two barn cats, a gerbil named Ariel, and a green-cheeked Conure named Jasmine. They also have two quarter horses, a paint stallion, an Appaloosa, a mustang from the Wyoming open range, and a miniature horse named Bayberry.In her spare time, Dr. Frost likes showing her Shelties at AKC shows and showing her paint horse in performance or Western pleasure classes. She’s also completed two marathons and multiple triathlons! It makes perfect sense that Jami would become a veterinarian—after all, she quite literally grew up in the clinic! Her mother, Dr. Phyllis Frost, is the owner of Avenue of the Saints Animal Hospital. Upon graduation from veterinary school, Dr. Mallen easily transitioned into a position right alongside her mother. Jami grew up a few miles outside of Plainfield, Iowa. She started her veterinary career as a Technician here at Avenue of the Saints Animal Hospital in 2007, gaining valuable experience for veterinary school. 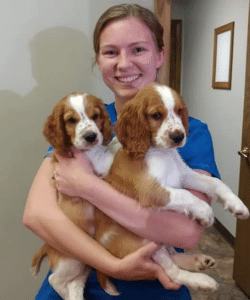 She completed her undergraduate studies at Wartburg College, majoring in Biology, before getting her DVM degree from Iowa State University’s College of Veterinary Medicine.Dr. Mallen has a special passion for internal medicine and loves the problem-solving approach it requires. She also loves doing new patient exams, helping a pet owner to transition their furry friend into the home seamlessly.Jami is married to her wonderful husband, John, who works as a Construction Project Manager. Together, they have five pets: two Siamese cats, Carson and Eli; a horse named Ebony; and two dogs named Kaylee and Bennett.Outside of her veterinary interests, Dr. Mallen loves to stay active by running 5ks, triathlons, mud runs, and marathons. She also enjoys do-it-yourself projects around the home, especially when she’s able to turn an old, tattered item into something beautiful. Jami also likes to read and quilt when she gets the chance. Dr. Mack started working here in January of 2017. Her family recently moved back to Charles City, where she is eager to build relationships with people and their pets! Dr. Mack has always been interested in helping animals. When she was younger, she dreamed of becoming a veterinarian because of a desire to learn how to help animals who could not help themselves, while helping the people that care for them so dearly. She considers herself lucky to have bonded with many animals throughout her life. They have all heaped to nurture Dr. Mack’s drive to care for animals and advocate for them. Her path to becoming a veterinarian started with graduating from Charles City Community High School. After this, she moved to Kirksville, MO where she attended Truman State University. Dr. Mack graduated from undergrad with a major in Biology and a minor in Agricultural Science (with a focus on Animal Science). It was then time to move to Ames, IA to start the long journey of Vet School at Iowa State University. This huge milestone was accomplished in May of 2006! Right after graduation, she started working at a clinic in Ames where she stayed for 9 years. It was sad to leave that clinic, but her husband’s job took them to the Twin Cities for a year. Finally, her travels brought Dr. Mack and her family here to Charles City! We are so happy she is back where the journey all started! Dr. Mack has a particular interest in dermatology issues and behavioral issues. She finds it very rewarding when one of these problems can be solved. Many of these issues need on-going care, and she enjoys working so closely with pets and their people. Part of a full household, Dr. Mack has dogs, cats, and kids! There is never a dull moment in her house. She enjoys being around the water (swimming, skiing, boating), reading, baking, walking, and most importantly spending time with her family. Growing up in Mason City, Iowa, Lisa’s family couldn’t have many pets because of her brother’s allergies. Since she had always adored animals, she wanted to make up for lost time! Now Lisa is a certified Veterinary Technician at Avenue of the Saints Animal Hospital. After high school, Lisa moved to Colorado and attended the Bel-Rea Institute of Animal Technology from 1988 to 1990. Immediately after graduation, she started working at a veterinary clinic. She came to Avenue of the Saints Animal Hospital in August of 2010.Lisa and her husband Rick have five kids together: Colin, Carrigan, Colbie, Maysen, and Hudsen. They also have a Jack Russell Terrier named Avalanche, two chinchillas named Gus and Gunner, and a Cuban Anole lizard named Freak.Lisa’s kids keep her and her husband very busy between college, high school sports, rodeos, and other activities. When they have a spare moment, they like to go camping as a family. Dana is a registered veterinary technician who joined us in October 2017. She moved to the area from Des Moines, IA after getting married to her husband Eddie in September of 2017. Dana graduated from Des Moines Area Community College in June 2007. Some of the things she enjoys most about her job are internal medicine cases, ultrasounds, lab work, and helping solve more challenging cases. She has 8 cats: Roxie, George, Buckie, Sox, PeeWee, Trigger, Scout, and Spotter. In her free time she enjoys reading, watching Cubs games, and yoga. Madison’s passion for animals and ever-growing curiosity for veterinary medicine is why she entered the field of veterinary medicine. Her interest in animals started at a young age, as most children. As she got older she began working in the hog industry which introduced her to aspects of the veterinary field. What she enjoys most about the job is the array of clients and patients she gets to see on a daily basis. She likes this part about of her job because it challenges her knowledge each day. Lori had worked in the human medical field for 14 years before coming to Avenue of the Saints Animal Hospital. When the opportunity came along to use her skills in the animal-care world, she jumped at the chance! Lori grew up in Knoxville, Iowa, with her two older sisters. She used to work at an oncology center in Des Moines, where she did medical transcription and administrative office work. Upon relocating to Nashua from Melcher-Dallas, she applied at the clinic and was hired shortly afterwards. She especially loves interacting with pet owners and hearing fun stories about their beloved furry friends.Lori and her husband, Tim, have been married for almost a year now. Lori has three daughters of her own, Jaymi, Hayli, and Lexi, and Tim has four children named Hannah, Olivia, Caleb, and Sam. As a family, they love attending the kids’ sporting events and taking trips to Lake Michigan. Tim’s friend’s father was a veterinarian, and Tim would often hang out at the practice while growing up, spending time with the animals and watching surgeries. At 15, Tim started working for him. After college, he went right back into the veterinary field and hasn’t looked back since! Tim grew up in the country outside of Dubuque, Iowa. He moved to this area in 2008 from Davenport, where he’d spent eight years working at a veterinary practice. He wanted to work at a clinic that had the same high standards of care and service he’d become accustomed to, and Avenue of the Saints Animal Hospital was the perfect fit! Tim particularly likes meeting all the wonderful pets who come through the clinic doors and getting to know their owners. It’s especially fun for him to watch a family’s children grow up alongside their pets.Tim lives with his wife, Tonya, and their son Joseph. As a family, they like to fish and camp together when they’re not attending Joseph’s sporting events. The family shares their home with three cats, Trotz, Chain-e, and Marshmallow, as well as a friendly Golden Retriever named Toby.Tim has been brewing his own beer at home for nearly 10 years; his brews have even won awards at contests! He’s also a passionate BBQ-er, and likes to put his signature barbeque rub on chicken, brisket, ribs, and his specialty, pulled pork. Right after graduating high school Kylie applied to the large animal vet tech program at northeast Iowa Community College in Calmar, Iowa.She started the 2 year program in fall of 2016. She was drawn to NICC because of the large animal aspect and it being close to her home. As school went on Kylie learned she preferred companion animals to livestock. She would still like to work with horses but she is also happy with dogs and cats. She graduated in May 2018 and has been at the Avenue of the Saints ever since.